The Visual Science Lab / Kirk Tuck: A reposting of an image by reader request. And a mea culpa to Aaron. A reposting of an image by reader request. And a mea culpa to Aaron. And I do owe an apology to reader, Aaron. I misread his comment about there being no difference in changing lenses to other focal lengths or zooming. I presumed we were talking about staying in one place and zooming versus changing positions and "zooming with one's feet." He is, of course, absolutely correct. Sorry about that! I have been doing variations of the three camera shoot for about a year now and I find it a fun way to shoot. I'm down to two Panasonic cameras now so my "three camera" system is now only being practiced with the three Olympus EM5 bodies. This week I am experimenting with using the 3 Sigma DN Art lenses for m4:3 as my trio of glass. The 19mm, 30mm and 60mm. While the wide end is not very wide neither is my vision... I absolutely love the 60, and I love the smooth black lens barrels. On a totally different note I showed up for jury duty yesterday fully expecting a painful three days in the service of democracy and the rule of law only to find out, from the judge, that both defendants in the cases copped a plea just before the empaneling which gave me back three uncluttered, unencumbered days. I spent this morning swimming, sipping a latte and eating warm chocolate croissants. This afternoon Studio Dog and I are going out for a run. Should be lovely. A nice gift from the scheduling universe. That looks so Life Magazine! 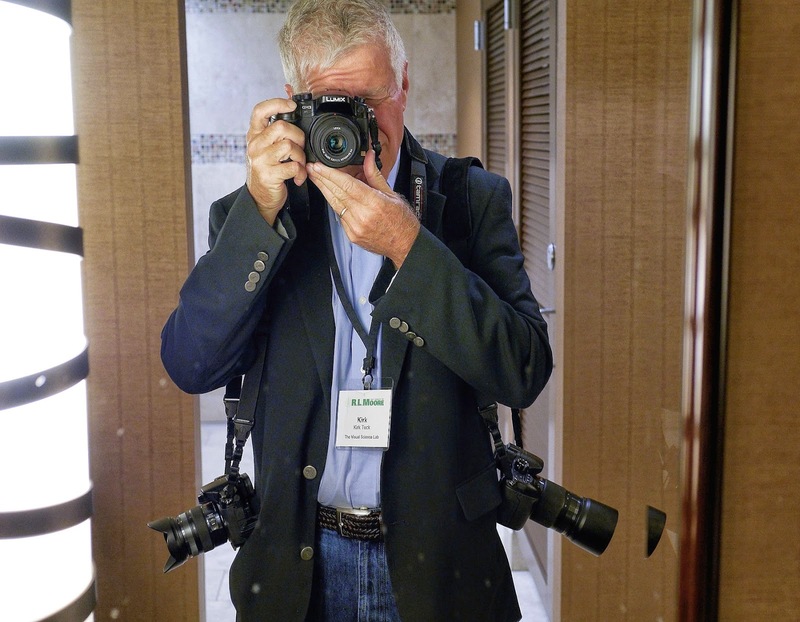 I understand that Gene Smith used to wear five cameras at a time, when they weren't in the pawnshop. Kirk, I am blushing for having made the header of your post. I am now feeling ungrateful for you feeling the need to say sorry for anything! As a daily reader of your blog I never say 'thank-you' while reading your daily thoughts and admiring your images which you kindly share, so I'll take this opportunity to sincerly say 'thank-you'. No blushing required Aaron. When I'm wrong I'm wrong. And I felt that I jumped on your comments a bit too quickly anyway. Humility. I'm trying to practice it more since the lack of is one of my leading weaknesses.